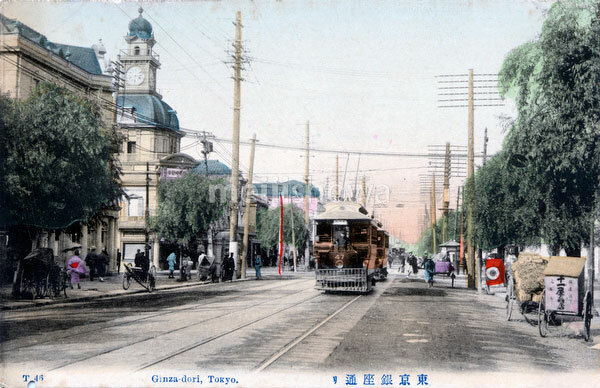 Two streetcars pass by the Hattori Building in Tokyo’s fashionable Ginza. Carts are parked under the verdant willow trees. The Hattori Building was one of Ginza’s main landmarks. It was the home of K. Hattori & Co., a watch and jewellery shop opened in 1881 (Meiji 14) by Kintaro Hattori (1860-1934). This photo was shot sometime between 1911 and 1913, so it’s either late Meiji Period or early Taisho Period. See the blog entry for more info.